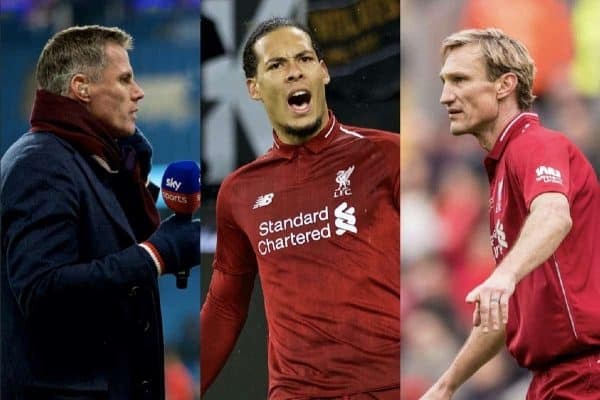 Virgil van Dijk has received high praise from two of Liverpool’s greatest centre-backs, with Jamie Carragher and Sami Hyypia in agreement on their successor. Van Dijk’s impact since joining the Reds from Southampton has been immeasurable, providing Jurgen Klopp‘s side with the top-level defender they have needed for so long. Saturday’s Liverpool Legends clash with Milan Glorie saw some of his most esteemed predecessors from the Premier League era take to the field, with Carragher and Hyypia both starting alongside Daniel Agger. 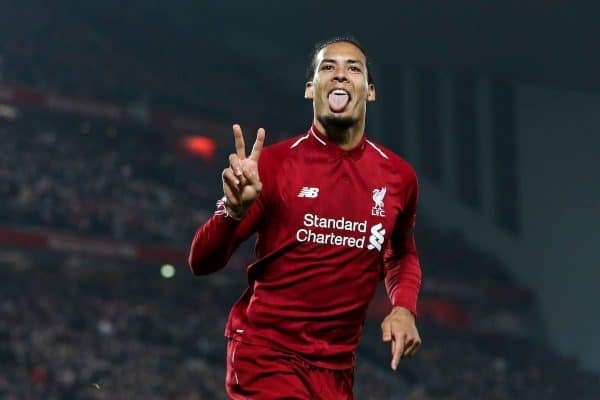 It can certainly be argued that Van Dijk’s influence is vaster than any of those three, as the Dutchman has transformed the defensive efforts at Anfield over the past 14 months. Now, he is considered a favourite for the PFA Player of the Year award, and by many as the best centre-back in world football. Carragher is one of those who believes Van Dijk deserves the top end-of-season prize, telling LiverpoolFC.com that he has proved himself worth more than double the £75 million paid to sign him. “With the performances he has given this year I think he’s been the best player in the Premier League,” he said, having labelled the No. 4 the best in Europe in his position. “I’ll be surprised if he doesn’t win PFA Player of the Year. Van Dijk’s efforts have been aided by the continued reinforcement of Liverpool’s spine, with Alisson brought in for £65 million and Fabinho for £39 million. It is certainly a collective improvement, but it is impossible to ignore how playing alongside Van Dijk has also lifted the likes of Joe Gomez, Joel Matip and Dejan Lovren. To that end, Hyypia described the 27-year-old as “the most important player for the team,” hailing his ability to enhance the qualities of those around him. “Alisson came in the summer and we made some good signings in the midfield as well, but I think Virgil van Dijk is the most important player for the team,” he told Sky Sports. This praise comes on the back of the legendary Franco Baresi describing Van Dijk as the main reason why Liverpool have “grown hugely” of late, and given the credentials of him, Carragher and Hyypia, it would be hard to dispute.